I was at a party when an interesting topic came up — inventions that changed the face of humanity. One by one, the entries came: Computers, the telephone, the steam engine, the alphabet, etc. Occasionally, various people would look up from their devices to say something, but mostly we were all just trying to follow along while keeping up on our texts, status updates, Facebook uploads and Googling. 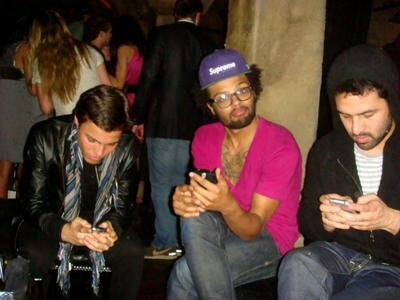 We each had one eye on the conversation and the other eye on our screens. I was guilty of it too. I had hundreds of emails in my inbox, so I was performing routine maintenance, cleaning out stuff and filing it, while trying to hold a conversation. Sadly, I do this more often than I care to admit. I always think I’m listening when people are talking to me, even though I’m not. What I’m actually doing is checking messages and shooting off emails. (This is why I schedule important calls, to eliminate distractions. I have no willpower otherwise.) I often write, read my RSS feeds, Tweet, update my status and check out CNN or Newsy, all at once. Even when I’m “relaxing,” I still hop online while watching American Idol and texting friends. But that’s pretty common, natural even… isn’t it? Well, it’s at least common. 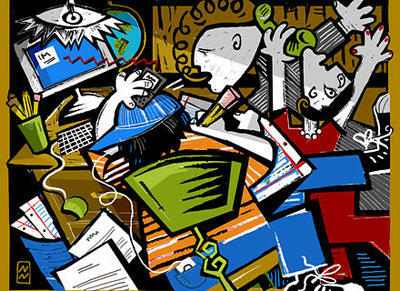 For many of us, our multitasking ways (that stress us out at work or at school) often bleed over into the rest of our lives. In fact, after going on unchecked for so long, it’s becoming ingrained into our personalities. Some say this is the new normal. But sadly, “normal” isn’t so good for us. Recently, The New York Times ran an article titled “Message to Executives: Stop Multitasking.” I’m no high-powered exec, and this isn’t exactly stuff I gravitate toward — stories like this might as well be titled, “Adriana, you need to exercise and eat more fiber” — but this was different. McKinsey makes the case that head honchos need the time and focus to consider, reflect, assess information and make decisions. 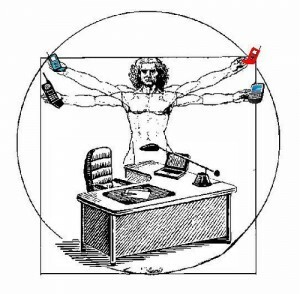 But numerous studies indicate that multitasking actually slows down productivity, blocks creativity, causes anxiety and can even be addictive. Target reader aside, who can’t understand the pressure to do more, faster, better, and more often? It can apply to anybody — teachers, parents, spouses, artists, chefs, writers, scientists… and yes, tech enthusiasts. (Perhaps especially tech enthusiasts.) The benefit of focus, consideration and even non-distracted reflection in good decision-making is universal. Unfortunately, we’re allowing for that less than ever. That’s not to say that the way we live is bad. In fact, these are exciting times — never before have people had so much connectivity and computing power at their fingertips, and the benefits of that are staggering. However, there are pitfalls. As the hardware gets increasingly powerful, particularly mobile products, it allows us to do more with it everywhere we are. So, naturally… we wind up doing more with it. Much more. Everywhere we are. And often simultaneously. Even when we’re not working, our minds can feel like we’re still on the clock. With instant communication and social networks being so prevalent, there’s real pressure to engage or respond immediately, regardless of whatever else we’re doing. That may be one reason why, even though we know this lifestyle isn’t good for us, we persist. We succumb to that pressure. And we get used to it, even add to it — so much so that we have a hard time stopping. Now, before you get the wrong impression, I’m not saying that gadgets are evil. (Oh please. What site do you think you’re reading? I love tech.) They are tools, and as such, they can enable so much. But it all depends on how we use them. These days, on an individual level, we seem to be pointing them in a dozen different directions at once. We are multitasking ourselves crazy. The good news is that there are things we can do about it. According to McKinsey, the key lies in Focusing, Filtering and Forgetting. Do one thing at a time. Do not overwhelm yourself with tasks (i.e., delegate). And take breaks to clear your head. That’s all there is to it. Doesn’t get more straightforward than that. Now for the bad news: Just because it’s simple doesn’t mean it’s easy. In fact, it’s downright hard. Some of us can’t even seem stop long enough to enjoy a social outing. Party People in the House Say What? No wonder I wasn’t having much fun at the party. No one was really present (including me), so it was tough to engage at first. But this event wound up standing out for a couple of reasons: It was a perfect microcosm of our multitasking-addicted lifestyles, and it turned out to be a great example of what can happen when people give that up and start focusing. We all thought the same thing: No way. That can’t be right. All of a sudden, there was furious finger tapping on small screens. Some were Googling, others were sending out Tweets and texts asking about it. A few even chucked their phones and ran to the host’s desktop, while one guy busted out his iPad. Somehow, it became imperative to find out if Crapper really invented the commode. It even became a race to find the answer. It was absurd. And somehow it wasn’t. If this were a research experiment, some white-coated scientist would’ve noted the exact time that the mood in the room turned. It was the moment we ceased all other unrelated activity. We found out that the appropriately named Thomas Crapper did exist, even filed patents relating to the toilet, but didn’t invent it. (The honor goes to Sir John Harington.) That was enough to ignite some potty jokes, and the jokes led to funny stories, and before we knew it, we were all suddenly at the party. That’s all it took to turn the night from boring to awesome, and there it stayed for the rest of the night. 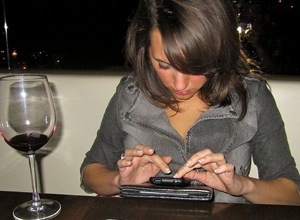 As for the gadgets, I’d like to note that we used the same devices that distracted us at first to bring us together. They even became discussion topics as the night wore on, with us sharing our favorite gear, apps, photos and music. So ultimately, our tech didn’t change. It was our behavior that did. 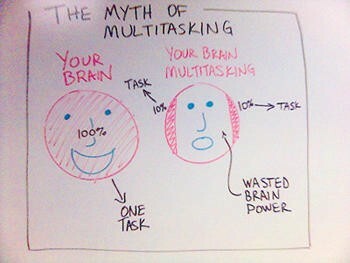 Perhaps we can’t completely eliminate multitasking in our lives, but we can get a grip on it. Just like we shut down applications when our systems start to lag, maybe we should do the same for our brains. We owe it to ourselves and the people around us. After all, it’s just a matter of routine maintenance, isn’t it? For more on this, click to see the article at the McKinsey Quarterly. There are also many books available on the subject, one of my favorites being Dave Crenshaw’s The Myth of Multitasking — How “Doing It All” Gets Nothing Done. Check it out, if you’d like to learn more.